During a workshop recently, a participant asked me if an old-fashioned snail mail sales letter still works for generating leads. Out of a group of 31, three raised their hands. That might not sound very impressive. In fact, that example might confirm your suspicion that a direct mail letter is a dinosaur of a marketing tactic that doesn’t fit in today’s online world. You see, in addition to those three who came to my workshop by way of a sales letter, I have two private consulting clients who found out about me that same way. Sales letters can be an effective lead-generator — if you use them correctly. I use sales letters regularly in my own business. And I write them for my private clients as well. Use a highly targeted list filled with ideal prospects. In fact, I wouldn’t bother with any other kind. A two-page letter tends to work best. Yes, I know that flies in the face of current “no one reads more than a page” wisdom. But for me and my (mostly B2B) clients, the two-pager is often the winner. The more a letter looks and reads like an actual letter – and not a polished marketing piece – the better it works. No surprise there. Lumpy letters (with something inside, like a stylus pen) get opened more often. However, the freebie or gimmick often gets all the attention and the prospect never reads the letter! 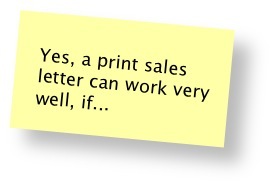 I prefer to focus instead on writing a great sales letter and having it stand on its own merits. Don’t force the prospect to reply only via a website landing page. Also provide the option to call or email. Phone and email responses typically come from higher-quality prospects. Of course there are many other tips and tricks for creating a marketing letter that brings in the business. Those are just a few. So if you’re not currently using a persuasive, inviting letter to call on prospects, consider it. You might discover it works well for you, at least as a supplement to your other sources of leads. Bravo! I sell a consulting service B2B. All of the senior managers I contact suffer from email overload. Once I have a target company, I will instead send a registered letter to the CEO or target person to get their attention, generate interest and let them know I will be calling. This way my message stands alone and is not competing with 100 easily disposed of emails in their in-basket. The the registration of the letter says, “This is important,” before it is even opened. Direct mail is alive and well. It has never gone away. And, today with the onslaught of email in people’s in boxes, snail mail is making a “comeback” as a welcome sight in the mailbox (of course, it still has to be targeted to the audience). All the tips you provided have long been pointers to implement in direct mail – good advice worth implementing. Snail mail is definitely alive and well. People receive hundreds of email messages each day but only a few letters and packages. Snail mail stands out and people physically handle it before dismissing it. This gives you an opportunity to reach out to them. Plus, you can send free promotional items in snail mail to get attention. Offering them through an email link is just not the same. This is great to know that I just did the right thing yesterday by mailing some letters. I had thought about how to do it for a week. It was original, personal, and didn’t look like the rest of their mail. I used a highly targeted list because they were already customers. I just wanted to keep them and show them an opportunity. It read like an actual letter. I also provided the option to call me. I just figured that they probably don’t get many letters like this anymore and it was filled with good news about an opportunity for them.